In Cabinet type Shotblasting machine you will find two different types of machines one is Suction type Shotblasting machine and the other is Pressure Type Shotblasting machine. In Suction Type Machine it eliminates burrs, flashings etc. and other defects from castings and automotive components. It is one of the most simplest way to remove corrosion and old paint. It has a very good industrial demand in the market and widely used by small and medium scale industries. This product does not requires much maintenance in comparison to different other blasting machines means it is a money saver machine. This machine is known for its low maintenance cost, long lasting and light weight for easy shifting. It is ideal for heat treatment shops, dye, mould & tool makers etc. In Suction Type shotblasting Machine, the debris & dust are segregated and only clean & sized abrasive are conveyed to blast guaranteeing a homogeneous finish. It is useful for Touch up work of light metal components. It has longer running time with very excellent durability with high efficiency and user friendly interface. There are various advantages of Suction Type Machine like less moving parts and valves makes the suction type machine maintenance easier. 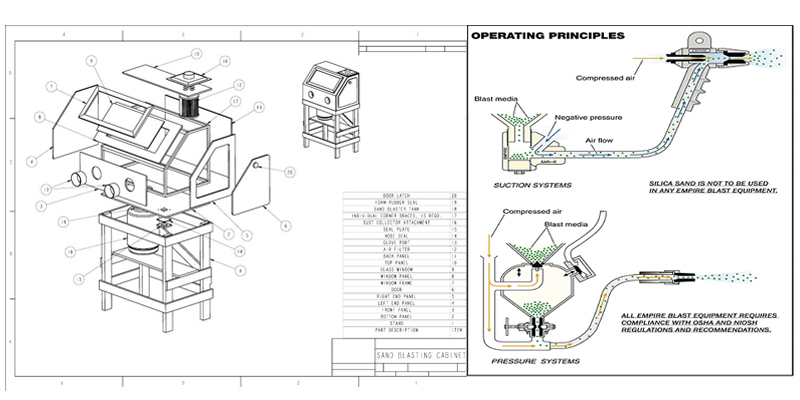 Air requirement of the suction is totally depends upon the air injector size, which is much low. In Pressure Type Machine blaster emits the abrasives with high pressure that cleans surface rapidly. It is highly recommended for removal of sand, rust, corrosion, coating removal, Contaminant Removal, paints, cleaning of castings Tube Cleaning and forgings etc. It has greater intensity compared to suction type machine and it can increase your production by 100 percent. You can use different types of media steel abrasive, sand, garnet, aluminium oxide, glass bead, coconut shell etc. It provides an excellent surface for bonding and plating. It leaves a very good finish on most metals. We offer the most economical and high quality shot blasting machines in India. There are many manufacturers of shot blasting machines in India but our focus is not on sales but on the providing our customers with high quality shot blasting machines and a prompt after sales service. 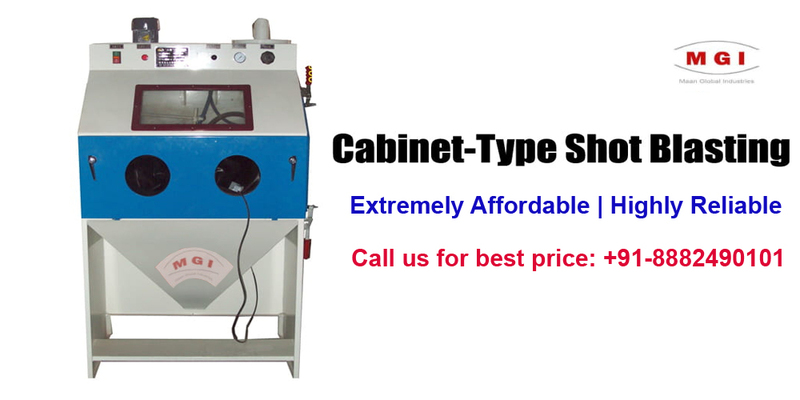 All our shot blasting machines are made of highest quality of raw materials and have longer life and this is what makes us the best manufacturer of Shotblasting machine in India.